Designer Szymon Hanczar successfully transformed his 140 square foot crash pad into a surprisingly livable and aesthetically impressive tiny home. How did Hanczar manage to create such a functional space? On the following pages, you will find four lessons learned from this ​super-efficient apartment. A tiny apartment packed with too much stuff can feel more like a cramped, claustrophobic cave instead of a comfy, cozy dwelling. 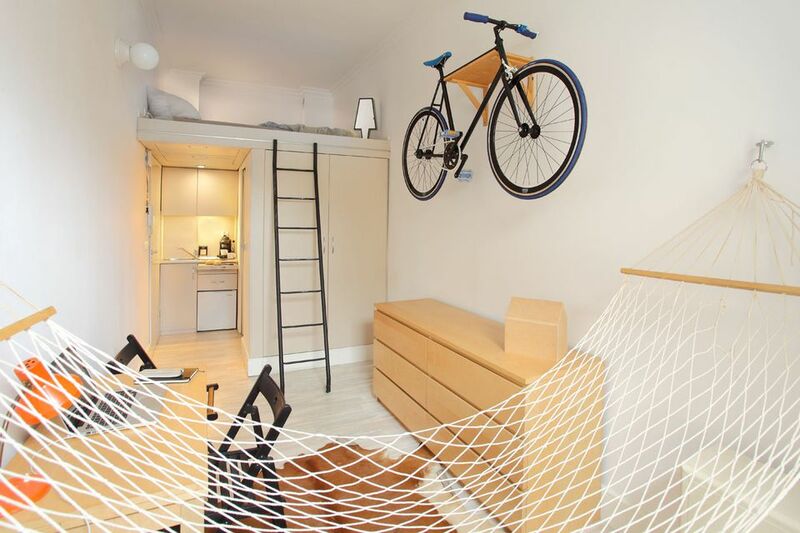 So if you don't want to go virtually bonkers while living in a micro living space, repeat after me, "less is more." Eliminate visual clutter. Piles of paper, messy countertops and too much décor like overdecorated walls can make both small and large spaces feel chaotic. Keeping flat surfaces clean and clutter-free will make life at home more orderly. Keep things light. Walls, flooring, and furniture in light shades make pint-sized spaces feel bigger and brighter. Ditch useless furniture. All the furniture in Hanczar's small living space has a practical purpose. His desk doubles as a dining table, the dresser provides extra storage space and his hammock carves out a spot to relax without wasting precious floor space. He prioritized his belongings. He keeps clothing in his dresser and large items in the closet. He created easy access. There's no poking around to find stuff in this closet. All of his things, including the washing machine, is within easy reach. He made sure he had enough headroom. He has just enough clearance to stand tall in the lower rooms, and room to sit upright in his bed. He sacrificed some kitchen square footage so he could have a roomier bathroom. He doesn't cook so he decided to live without an oven or cooktop. What's in his tiny kitchenette? A compact fridge, coffee maker, and a teeny countertop so he can make sandwiches and a cup of mud whenever the mood strikes.